WARNING: Viewer estimates are advised. A Canadian Catholic priest was stabbed in front of dozens of stunned worshipers as he celebrated mass Friday morning in Montreal's St. Joseph Oratory. The Montreal police said a 911 call was located around 8pm. 8.40 local time. When officers arrived at the landmark church, a male suspect had already been detained by security guards. Philip Barrett, sitting near the front of the church, said he saw a tall man who seemed to be a Caucasian in his 30s, rising from a pew and quickly moving to Rev. Claude Grou, Oratoria's Rector. He walked behind the altar and seemed to strike the priest's body, Barrett said. "I think the priest fell down at that time. I remember the priest moving away from the man, but it happened so quickly that there was almost no time to react." The service was live streamed in a Catholic channel. 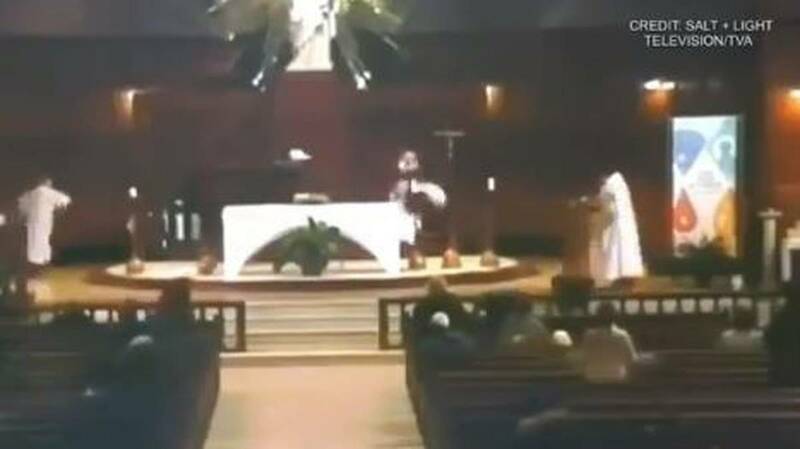 Video shows a tall man in a dark jacket and white baseball cap rounded the altar and charging at Grou when he presses his right arm against the priest. Grou drives back a few steps before the attacker pushes him into a banner. As screams are heard in the background, a group of people run forward, surround and block the suspect. – On the news line (@OnTheNewsLine) March 22, 2019  Barrett said people quickly hindered the suspect who did not fight. He said the suspect did not speak or shout during the attack. There was no other information that was immediately available on why the pastor could have been attacked. The suspect was to be asked by the police on Friday morning. Barrett said that Grou crumpled to the ground after the attack, but he seemed conscious and alert about 15 minutes later when paramedics helped him to an ambulance. He said members of the congregation immediately began to pray. "We are reassured, because when he left the oratorio he was conscious and able to speak as we see as a good sign," said Celine Barbeau, a spokeswoman for the church. St. Joseph's Oratory is among Canada's largest churches, and pilgrims from around the world are attracted to its domed roof and stunning architecture. Barrett said that like the rest of the approx. 60 people who were present were shocked that an attack would take place in a place he has come to see as a haven. "I really find it a welcoming place," he said. "I just hope that as a result, I can imagine that they will need more security, but I hope they can still keep the welcoming spirit."